NOTICE: Activation key must be used on a valid Steam account. 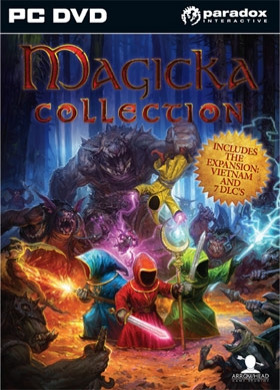 Requires internet connection.ABOUT THE GAMEMagicka Collection includes: Magicka Magicka Vietnam Magicka Wizard Survival Kit Magicka Caverns and Marshlands Magicka Nippon Magicka Final Frontier Magicka Frozen Lake Magicka Watch Tower Magicka Robe BundleDon the robes of an elemental wizardof a sacred order, and stop an evilsorcer… er who has thrown the worldinto turmoil. Ah yes... we can’t haveturmoil now, can we? Play solo or joinforces with up to three friends, andsave the world and all its undeservingvillagers from certain doom! KEY FEATURES Team up with your friends against the forces of evil with up to four-player co-op in all game modes or explore the expansive world in single-player mode Test your skills in the magickal arts with an innovative spell casting system Fight your way through 13 challenging levels Find and unlock challenges, items, and powerful Magicks Laugh along with this tongue-in-cheek parody of fantasy world clichésSYSTEM REQUIREMENTS Operating system: Windows XP/Vista/Windows 7 Processor: Intel Pentium IV 2.4 GHz or AMD 3500+ Memory: 2 GB RAM Hard disk space: 2 GB Available HDD Space Video: NVIDIA GeForce 8800 or ATI Radeon X1900. Integrated Graphics (laptops) are not supported Sound: DirectX-compatible sound card DirectX®: DirectX 9.c 3-button mouse, keyboard, or Xbox 360 Controller for Windows Internet connection for multiplayer Offline Multiplayer: up to 4 controllers Online Multiplayer: DSL internet connection or faster © 2011 Paradox Interactive. All rights reserved.